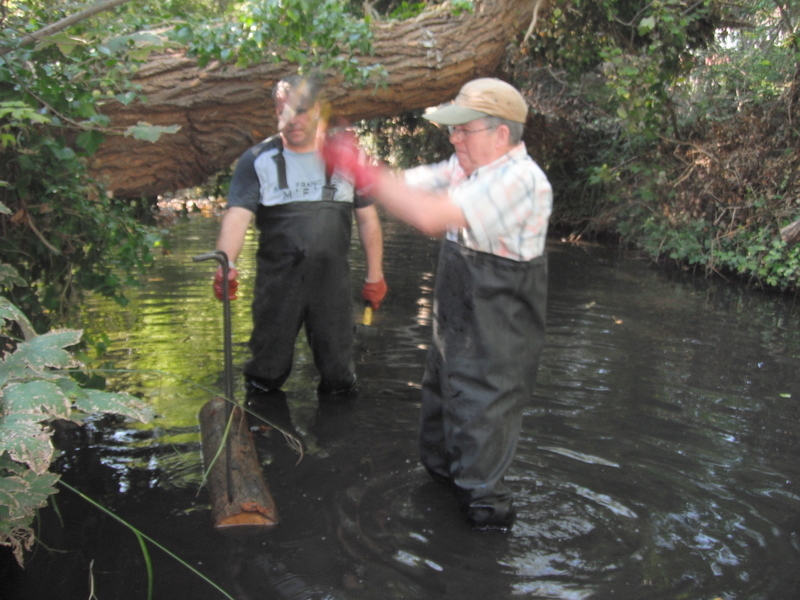 An unusually hot October weekend saw our intrepid volunteers back on the river at Carshalton, installing a second ‘dragon’s tooth’ berm in the river alongside Wilderness Island. 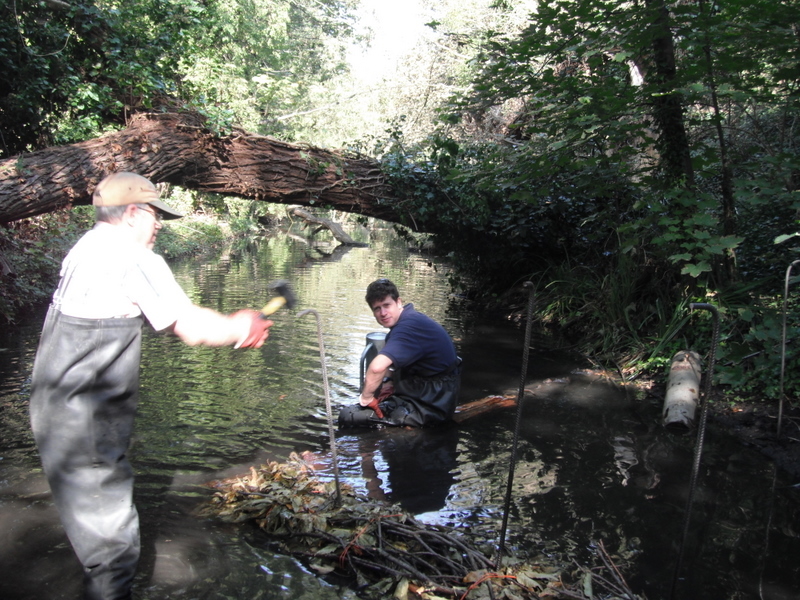 The ground was hard and required a lot of effort and adaptation of techniques to install the rebar rods. The picture below shows the finished dragon’s tooth berm, with the one installed previously in the background. 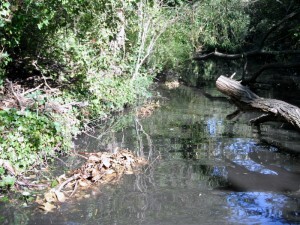 We now await the winter rains to raise water levels and fill the berm with silt. 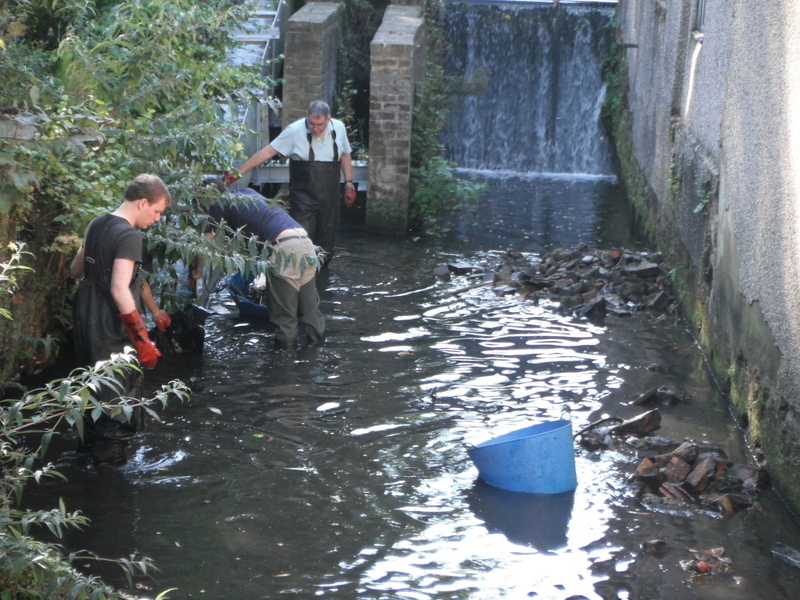 While the dragon’s tooth was being formed, a second team were busy removing rubbish from the river all the way up from Wilderness island to Grove Park. 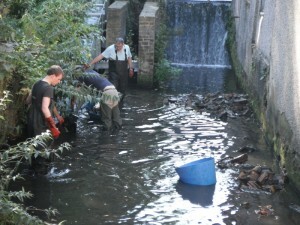 Below Butter Hill weir and fish pass, another team of volunteers was hard at work resculpting the bed. 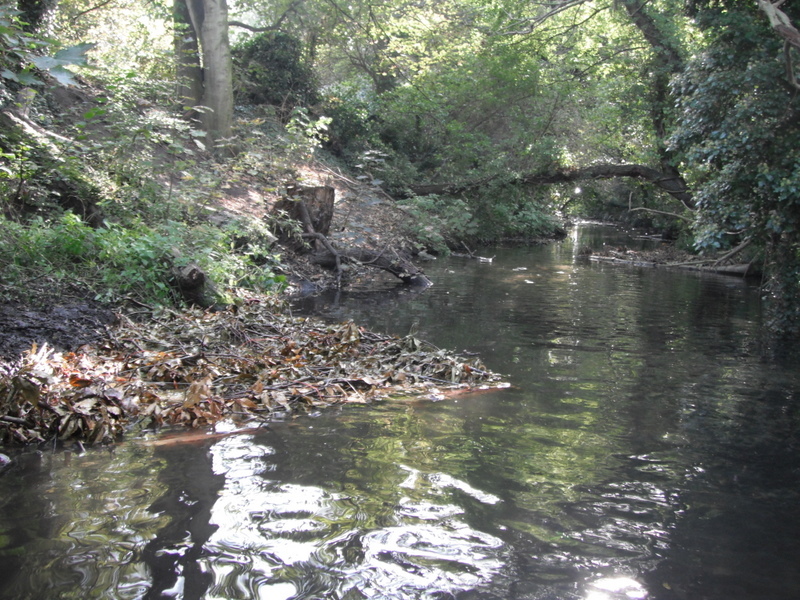 This involved moving some of the large amount of rubble and brick to one side to provide a deeper channel with more flow and a berm ready to be gravelled at a later date. 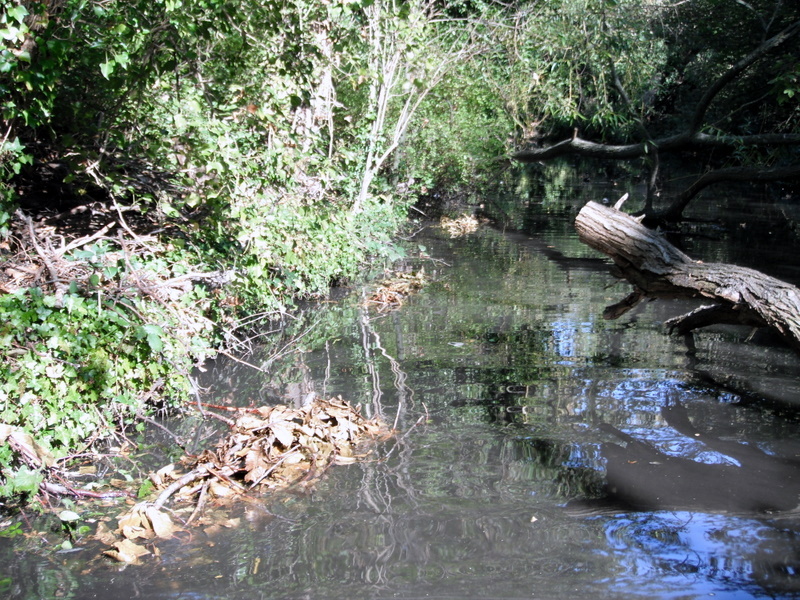 The deeper water will provide better habitat and cover for fish and the berm can be planted to provide more habitat. 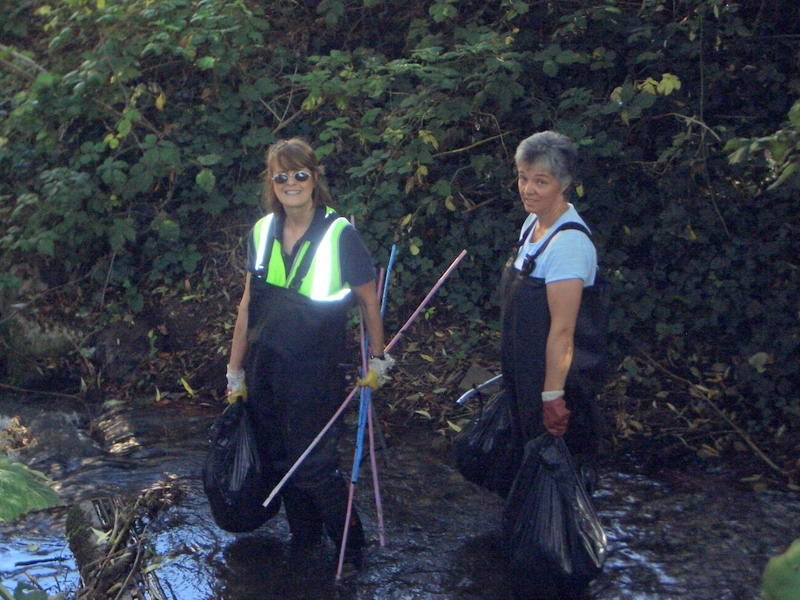 The stretch is now ready for gravel to be introduced at our next volunteer event. 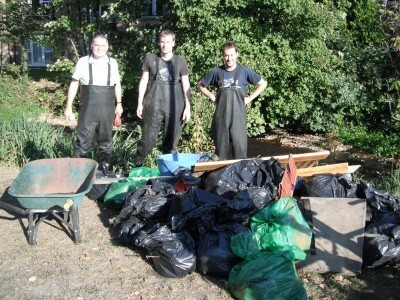 John, Steve, Gearoid and the rubbish pile! Many thanks to all our enthusiastic volunteers: Anne, Chris, Gearoid, Gideon, Jez, John N, John P, Sally, Stephen, Steve and Theo. This event was supported by the WATER project selected within the scope of the INTERREG IVA France (Channel) – England cross-border European cooperation programme, co-financed by the ERDF. 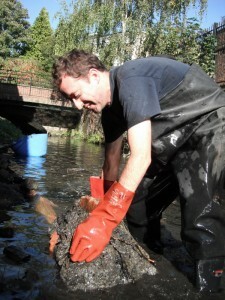 This entry was posted in Uncategorized and tagged Events, River restoration, Wandle on October 11, 2011 by Tim.